The Baltic Sea is a charming part of northern Europe and has so many options on different cruises, including Stockholm, Helsinki, Tallinn and St. Petersburg! Unravel the intrigue of the former Eastern Bloc, be dazzled by the jewels of Scandinavia and admire some of the world’s most spectacular landscapes on board a Baltic Sea cruise. Immerse yourself in a curious world where old meets new, where ancient landmarks blend effortlessly into urban metropolises and charming traditions flirt with cosmopolitan culture. Cruise the Baltic Sea for the chance to marvel at the magnificent Norwegian Fjords, admire majestic architecture in St Petersburg or stroll winding cobbled streets in Tallinn’s charming old town. Cruise the Baltic Sea in the epitome of comfort and style from Amsterdam, Copenhagen and Berlin on board Royal Caribbean, Norwegian Cruise Line or Viking River Cruises. Copenhagen is situated on Denmark’s southern coast, straddling the Baltic Sea. The bustling Nordic metropolis has been named the happiest city in the world, luring visitors year-round with its intriguing history, charming Scandinavian culture, colorful architecture and quirky arts and design scene. The city is renowned for its magical Tivoli Gardens, a fairytale-like amusement park and national treasure, which has been captivating creatives like Walt Disney since 1843. St Petersburg, nicknamed locally as ‘Venice of the North’, is undoubtedly one of the most beautiful cities in the world. There are hundreds of canals and bridges interlacing St. Petersburg, making the sprawling metropolis an excellent opportunity to explore by boat. A walk through historic St. Petersburg feels akin to being in an open-air museum filled with centuries old landmarks, lavish gardens, and imperial palaces, which earned the city a place as a UNESCO World Heritage Site. Tallinn is situated on the northern coast Estonian coast facing the Baltic Sea. Tallinn’s old town lures tourists with its remarkably well-preserved Medieval architecture, where narrow streets and secret passages often lead to charming squares. Tallinn is also renowned for its gastronomy scene innovative local chefs, which blessed with exquisite local produce apply old traditions with new techniques to create delicious nouveau cuisine. Located on the southern tip of Finland lies Helsinki, the country’s largest and capital city. The Archipelago of Helsinki spans over 315 distinct islands, which provide an easy escape from the hustle and bustle of the city into its surrounding natural wonderland. Cultural, stylish, and full of life Helsinki is Helsinki still compact enough to explore on foot or by bike like the locals do. Stretched across 14 islands and dozens of bridges, Stockholm is the capital and the commercial, cultural, and touristic hub of Sweden. Stockholm offers three UNESCO World Heritage sites: The Drottningholm Palace, Skogskyrkogården (The Woodland Cemetery) and Sweden’s first city of Birka. The Royal National City Park is the world’s first national city park, housing hundreds of wildlife species, historic museums, and even an amusement park. The quaint port town of Warnemünde, a popular gateway to Berlin, is situated on Germany’s Baltic Sea coast. A tumultuous past has shaped the German capital into a vivacious multicultural metropolis and one of the most captivating cruise destinations in the world. Solemn landmarks, iconic sights and beautiful architectural heritage mingle fabulously with edgy alternative districts, gritty street art and progressive vibes. Berlin is a city that never sleeps, with a kaleidoscope of techno temples, leafy beer gardens, smoky bars and riverside clubs blessing Berlin as the party capital of the world. Kiel is the capital of Schleswig-Holstein and is one of Germanys northernmost cities. Kiel Sailing Week is a world-known sailing festival, when thousands of people flock from all over the world to the port city. The city has much to offer, in particular the marine area, the U-boat Memorial, Botanical Garden and the Olympic Village in Kiel-Schilksee. The city's blend of Northern German charm and a wide range of dining, shopping and hotels make it a perfect place to visit. Latvia's capital is the largest city in the Nordic and Baltic region. Riga is famous for its well-preserved downtown and Art Nouveau. In the city you will find historic spires and architecture of days gone by. The Freedom Monument which is almost 43 metres tall represents Latvia's path to freedom and is a must-see for many visitors. Riga's Central Market is also highly recommended, founded in 1930, the market, much like Riga itself is steeped in history and is one of the biggest marketplaces in Eastern Europe. Visitors can expect a lively atmosphere with plenty of bartering! Skagen is the northernmost city in Denmark and the place where the Baltic Sea meets the North Sea. When the tide is right, visitors can watch the amazing phenomenon as the waters from two different oceans flow into each other, creating beautiful color and current patterns. Its unique patterns of light and picturesque scenery drew groups of artists in the late 19th and early 20th century, and their artwork is still on display in Skagens Museum. Walk along the beach at Grenen Skagen, known as the "top of Denmark"
The port city of Klaipeda lies at the mouth of the Curonian Lagoon in the Baltic Sea and is the third largest city in Lithuania. The Danė River divides the Lithuanian city into the Old and New Town. Visit to discover the bustling old town with its many museums and Theater Square. Located at Theater square is a famous monument and fountain dedicated to German poet Simon Dach, who was born in Klaipeda. Klaipedia is also home to Lithuania's only substantial port, every Summer the Klaipeda tall ships race and regatta draws many visitors. Gdynia was made into one of Poland's busiest and most important sea ports after World War 1 and developed from a small village to a large urban centre quite quickly. The city also has reminders of its past, with historic buildings such as St. Michael the Archangel Church, which today offers insights into Gdynia's past as part of a sailing museum. There is also a thriving cultural scene in the city and an example of this is the annual Polish Film Festival, which is held in the city and is a must see event for any film-lovers. Denmark's second-largest city, Aarhus is a charming town with a thriving cultural and arts scene. With picturesque cobblestone streets and experimental Scandinavian architecture, the city is a blend of old and new. Take a walk along the harbor and get a glimpse of "the Iceberg," an unusual floating apartment building modeled after its namesake. Or walk along the winding streets and browse the colorful shops and quaint cafes in the Latin Quarter. You'll quickly see why this underrated Scandinavian gem is so popular among students and visitors alike! Visit the Aros modern art museum and walk through the rooftop "Rainbow Panorama"
Gdańsk is a bustling port city situated on Poland’s northern, Baltic Sea coast. The maritime metropolis possesses centuries of intriguing ancient, maritime and wartime history, and is renowned for its hordes of precious Amber, also known as the gold of the Baltics. The port city of Rønne is the capital city of Bornholm island. With a population of approximately 15,000 inhabitants, Rønne is also the largest city on the island. In the old part of Rønne, expect to find small cobble stone streets which lead you to St. Nicolai Church, which is surrounded by beautiful half-timbered houses and narrow charming streets. St. Torv is the main hub of activity in Rønne and on a market day people from all over Bornholm bring their best produce to sell. For a small place, Rønne has an interesting history which can be discovered in the Bornholm Museum. Baltic Sea Baltic Sea cruises provide the perfect opportunity to enjoy a combination of bustling cities such as Copenhagen, Helsinki, Tallinn and St. Petersburg, in addition to tranquil surroundings such as the Stockholm archipelago. 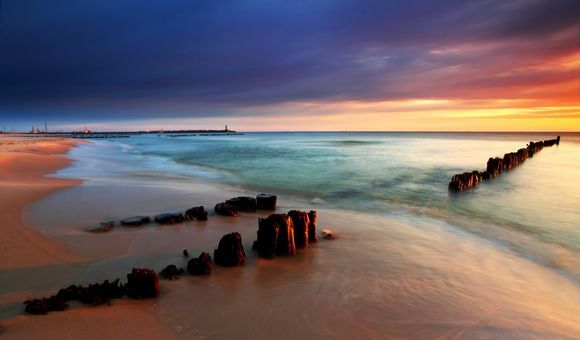 Baltic Sea offer you unlimited possibilities. Explore deep coniferous forests, historical sights, beautiful and unique fauna and flora, and bustling nightlife spots. Walk the medieval streets in Tallinn, travel back in time to Peter the Great’s gilded city of St. Petersburg and have your breath taken away by the Stockholm’s maze of waterways. Above, you will see a selection of some of the best, and most popular, destinations for the Baltic Sea cruise. Feel free to browse through our main cruise destinations of this region, or if you need some more inspiration, simply call our cruise experts. Dreamlines experts are on-hand to guide you through the booking process and find you an ideal cruise deal. Some of the most well-known destination in the Baltic Sea region are perhaps Stockholm and Helsinki and are celebrated for their spectacular architecture and scenic natural beauty. These cities with their medieval streets are perfectly suited to those cruise passengers with an affinity for middle ages and history. Other popular Baltic Sea cruise destinations include Tallinn, where the iconic narrow medieval streets are located and Copenhagen, which is home to charming Scandinavian culture, colorful architecture and quirky arts. There are too many wonderful places that must be visited to be believed! Book online your next Baltic Sea cruise. If you require more information then our cruise experts are only a phone call away. Call today on 1-888-403-1425 to speak about your options. All our cruise options including cheap and last minute cruises are available from our homepage. For other great international destinations why not have a look in European River Cruises, the Mediterranean or Western Europe.